Lillie’s Bordello hosted a number of major stars over the weekend. The popular Dublin hotspot opened its doors to Peaky Blinders star Cillian Murphy, following the premiere of his new film Free Fire at the Audi Dublin International Film Festival. The actor was also joined by producers Conor Barry and Macdara Kelleher. Oscar and Bafta winner Mark Rylance was also spotted at the famed Dublin club, alongside Irish actor Carl Finnegan. Most exciting of all, major Hollywood director Christopher Nolan, who is gearing up for the release of his new film Dunkirk, was seen at Lillie’s Bordello, where he was likely in the company of Mark Rylance and Cillian Murphy – as they recently worked together on his upcoming film. Cillian and Mark star alongside Tom Hardy and One Direction star Harry Styles, who will make his acting debut in the World War II drama. 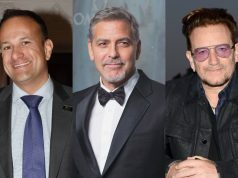 This weekend, Dublin welcomed plenty of stars as legendary director Martin Scorsese landed on Irish soil to collect a prestigious award from IFTA. The director struck up quite the friendship with President Michael D Higgins, and HERE are the pictures to prove it.